This story originally appeared on J-School Buzz and was edited and adapted for MediaShift with permission. It was written by David Teeghman, a recent graduate of the Missouri School of Journalism. To incoming students in the Missouri School of Journalism planning to buy an Apple MacBook just because it’s a J-School requirement, don’t do it. The Mizzou J-School has a habit of putting in place tech requirements whose benefits are not clearly articulated to students, particularly those who come from a lower socio-economic class." Apple computers offer almost nothing to the average journalism student you can’t find on a less pricey laptop, and certainly not enough to justify the outrageous price tag. And besides, what sense does it make to require all incoming students buy a laptop in the first place when there are so many computer labs throughout Mizzou’s journalism school with all the software we could ever need? One of the first things the J-School tells you when you show up for Summer Welcome before your freshman year (right after the part about how you will totally find a job, LOL) is that you need to buy an Apple laptop from the MU Bookstore with all the accessories. The official line from the Mizzou J-School is that you just need a laptop equipped with Windows Office when you enroll. In reality, you will be ostracized and made to feel unwelcome carrying any laptop not emblazoned with the Apple logo. 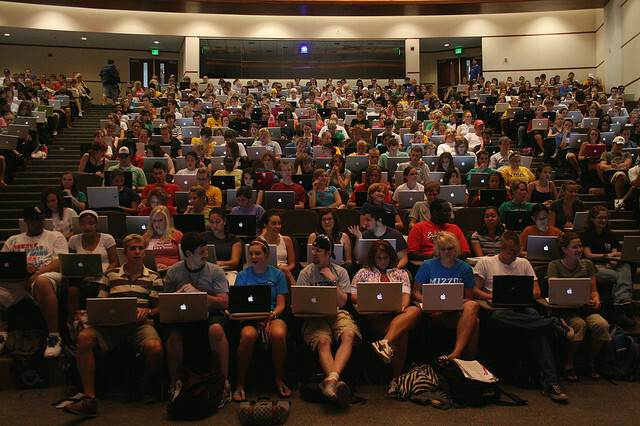 If you have ever seen the picture at the top of this post of a Mizzou journalism lecture class, you can see the J-School has been pretty effective at driving home the message that you need an Apple MacBook to make it there. The cheapest MacBook option from the MU Bookstore is more than $1,300, while the most expensive one is closer to $2,800. Each package includes such non-essentials as a specially branded Missouri School of Journalism backpack, flash drive, notebook lock and Microsoft Office. For all the good this laptop will do you as a journalism student, you would be better off buying a cheap Windows laptop from Dell, uploading all of your documents to Google Docs and Dropbox# and your music to Amazon Cloud Drive or Google Music Beta, and downloading the free Open Office suite of software. That will save you more than $800 on the cheapest package from the bookstore, and more than $2,000 on the most expensive one. Right in front of a Tiger Tech booth at a University of Missouri Summer Welcome fair, Lana Bailey is ready to cry. Her daughter, Katie, needs a laptop before she starts college in the fall, but they’re not sure which to buy. A pre-journalism student, she has been told the school requires, or at least prefers, a Mac. But she’s not sure what type of journalism she’s going to pursue, and that will make a difference. We later learn that Bailey is a first-generation college student and the child of a single mother. She is also making some hefty sacrifices to afford her college education, like paying for this laptop herself and skipping the dorms (er, residence halls) and living with a family friend in Columbia to save on room and board. Don’t put yourself through this misery, Katie. The Mizzou J-School has a habit of putting in place technology requirements whose benefits are not clearly articulated to students, particularly those who come from a lower socio-economic class. It’s an intriguing irony for a school based on the art of communication to mass audiences. I just graduated from the Missouri School of Journalism last month, and I can say with complete certainty that I never once did an assignment in a journalism class that I could not have done on a Windows-based computer. There is no piece of software or functionality in the line of Apple laptops that is essential to a journalism student at Mizzou or any other journalism school. The Mizzou J-School usually trots out the iLife suite of software programs on MacBooks as proof that these computers are essential to journalism students. The idea is that Apple computers come with programs that allow you to edit video, photos and even audio. But you will never use iMovie to edit video for a journalism class, never use iPhoto to edit photos, and never use Garage Band to edit audio. You will use top-of-the-line software programs like Final Cut Pro, Avid, Adobe Audition and, of course, Photoshop to do that work. In my reporting for this post, I heard from graduates and professors at the journalism schools at Loyola University in Chicago, Columbia University, New York University, University of North Carolina, University of Oregon, and Northwestern University, and it was only Northwestern’s Medill that has any sort of technology requirements in place like Mizzou’s. Not only is Mizzou unique in that it very strongly recommends students buy the much more expensive (yet not much more useful) Apple brand of laptops, but many journalism schools don’t require you to cough up money for any kind of required technology. The journalism graduates I spoke to said their schools did not have any set of requirements on what kind of phone, computer or audio recorder they buy. This came as a complete shock to me, as I have watched Mizzou’s J-School go so far as to even discuss the possibility of an iPad requirement (yes, really). Mizzou’s J-School is littered with top-notch computer labs that have the latest and greatest hardware and software that can do everything from edit video in Final Cut Pro to design a graphic in InDesign. Yet every freshman must buy a laptop of their own, preferably one of the most expensive brands out there. That doesn’t add up. To paraphrase, the first justification for the wireless requirement is that everyone is already buying one, so we might as well make it a requisite. Ninety percent is an awfully high figure, and though I couldn’t see the raw numbers for myself, my own experience has shown that a good majority of incoming students bought new computers, even if they weren’t required. But the slim minority who did not buy one must have had a good reason for doing so. Maybe it was financial burdens similar to the ones Katie faces, a problem that is certainly widespread in this economic recession. Now, I don’t want to be one of “those” people, but I should point out that a pen and notebook have the same capabilities to take notes on the fly. Estimated cost: the change rattling around in your pocket. So, that’s the justification for a wireless laptop requirement for every incoming student. It’s weak, but at least it exists. Why the strong Apple suggestion? This makes sense in theory. Students start out with simple media editing programs and move on to more complicated ones. But J-Schoolers don’t touch the iLife programs for any class. They might use it to Photoshop their head onto Mike Tyson’s body or edit a video for YouTube in their free time, but they won’t be doing it for a grade in journalism school. As Engadget and others have pointed out, Mizzou makes these Apple items “required” partly to manipulate financial aid rules. You see, financial aid will only cover items that are required by the school, not those that are optional or recommended. It’s not enough for the J-School to recommend we all buy Apple products; it has to “require” that we all buy them so we can include these expensive gadgets in our financial need estimates. That said, I am typing these very words on a MacBook Pro I received as a graduation gift from my parents. What’s more, I carry this laptop in the Missouri School of Journalism-branded backpack I got as a freshman. It’s a great computer, and given a choice between a Windows-based computer and a MacBook I would go with the MacBook every time. But I have been blessed to come from a family that can afford such extravagances. Not every potential journalism student is so lucky, nor should they be. Diversity in every respect should be encouraged in this journalism school, be it financial or racial or intellectual. From rising tuition to the journalism industry’s reliance on indentured servitude to stagnant salaries, it is becoming less and less feasible for students who don’t come from at least a middle-class background to make it in journalism. Mizzou’s J-School should not make it even harder for the less economically fortunate to succeed in journalism with superfluous Apple laptop requirements. 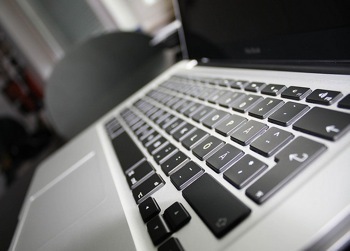 MacBook photo by Mikael Miettinen on Flickr. David Teeghman is a recent graduate of the Missouri School of Journalism, and the founder and publisher of J-School Buzz. Teeghman will soon be a Secondary English teacher in Indianapolis as part of Teach For America. A version of this story originally appeared in JSchoolBuzz.com, a site dedicated to reporting the latest news and analysis about the University of Missouri School of Journalism. Founded in October 2010, J-School Buzz is produced by current J-Schoolers. You can follow JSB on Twitter and Like us on Facebook. WTF i just want to say. that is the way to do business school and Apple Inc.
i haven’t read all the article. Its only for business policy.